Ubud is a city where cultural events related to art, music, dance and live literature have been held for centuries. It is situated in the central part of the attractive island of Bali in Indonesia. Centuries ago, Ubud had been a "royal city". Local rulers were called Jokorda or Agung, their descendants live in palaces of their predecessors to this day. On the streets of Ubud, one is almost always able to experience some cultural figures and artists. Some time ago, it was a collective place of tourists and bohemians from around the world. Today, the urban landscape has changed to another level, a picture of elegant resorts, surrounded by palm trees and beaches, where the numerous art galleries are regularly visited by famous collectors. If you decide to visit Bali, then Ubud is perhaps the most ideal place to stay. The city has a unique artistic and elitist atmosphere while being surrounded by beautiful scenery, lush paddy fields, small villages and pretty art and craft centers. 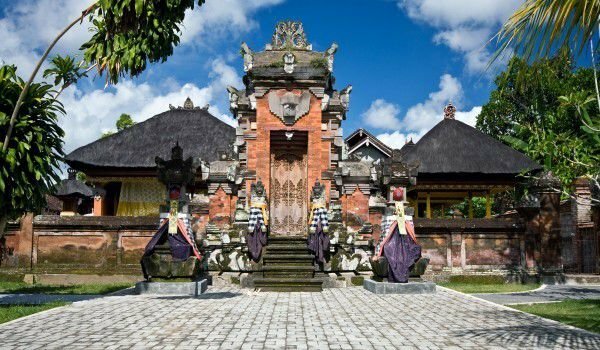 In the vicinity of Ubud are preserved several interesting palaces and temples, which are in excellent condition. The main streets of town are three, but to feel the true spirit of the Indonesian village, you must go through the narrow streets. Within them are scattered numerous cafes and workshops, where the culture actually goes with the atmosphere of the city. This town is actually much quieter than all other parts of Bali. The main attractions here can be toured with a walk, although the traffic and the heat may seem an obstacle. But if you want to enjoy the picturesque surrounding areas, it is better to take your car. In the south of Ubud there is a monkey reserve where tourists can feed the monkeys with bananas. Immediately after the reserve, recommended is a visit the Museum of Fine Arts, where you can see the rich collection of works of art. Among the works on display there are those from local artists, but there is the work of world renowned artists to see too.